Happy friday. Today in honor of breast cancer awareness month we are doing pink manicures. Two years ago before I started on the challenge I wore pink manicures for the entire month of October. 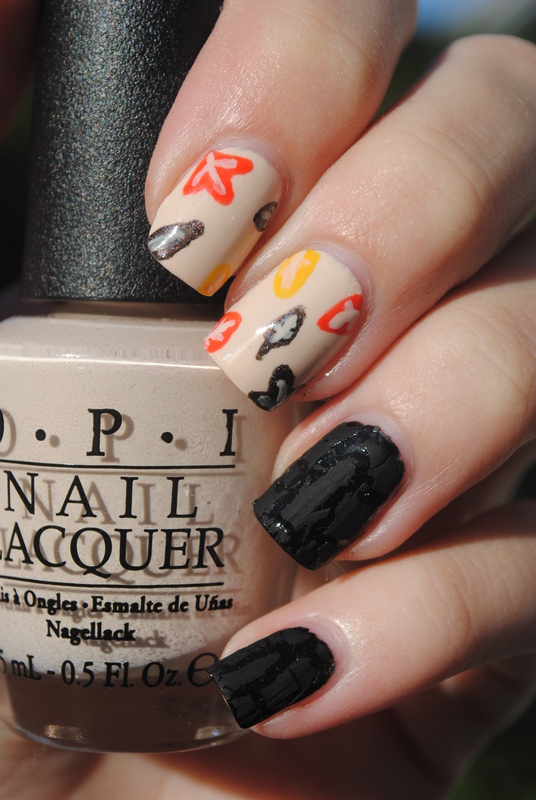 I was so happy with my leopard manicure from last week, that I decided to do the print again. Also a leopard is a really strong and fierce animal, something that all the ladies and men battling breast cancer or any other form of cancer is. I used two coats of Illamasqua Pink Raindrops for the base, China Glaze Put a Bow on It for the spots, and OPI Black Onyx for the outlines. On my index finger I used three coats of China Glaze Full Spectrum and a coat of OPI Pink Shatter from the Pink of Hearts collection from 2011. On my thumb and ring finger I used three coats of OPI More Than a Glimmer from the Pink of Hearts collection form last year. If you want to help in the battle against breast cancer a lot of nail polish and make up companies make specific pink products where a percentage of the sale goes to research. I know OPI, Essie, China Glaze and Orly usually does a pink collection for the month of October. Click on the blue blob to see how the other ladies have used pink polishes this friday. I anledning af oktober måned og støt brysterne har vi i dag lavet pink manicure. Jeg elsker lyserød og så er det også en rigtig god sag vi støtter i hele oktober. Klik på den blå blob for at se hvordan de andre har brugt pink. The fall is in full swing in Denmark and have been for almost a month. It’s getting colder and the leaves are turning and it’s getting windy. I got myself a cold last week, but I’m almost over it, which is pretty good since I’m going away to a conference for the weekend. 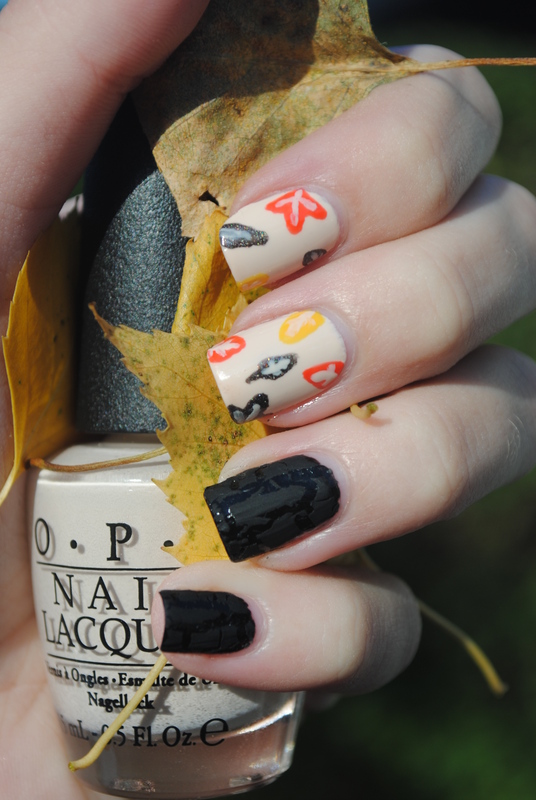 Today the nail art is inspired by the Fall season. Fall to me is a lot of things. It’s the pretty colors on the trees, eating soup and carving pumpkins. 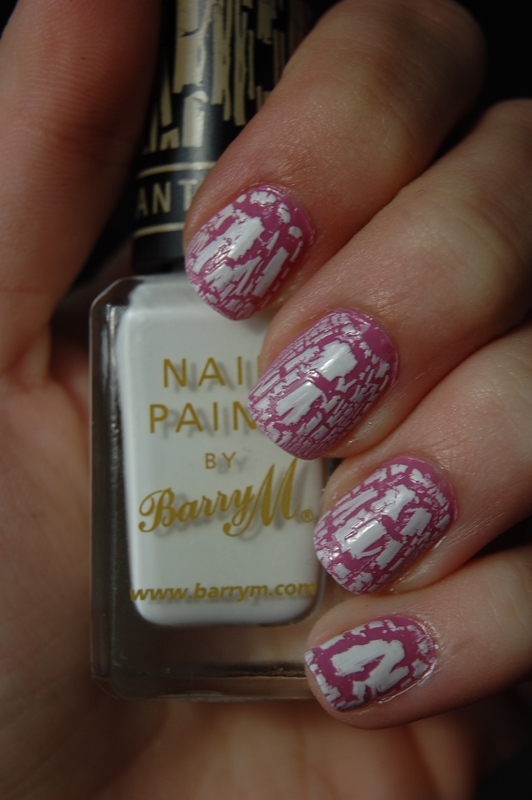 For this nail art I painted leaves and did leather nails. Leather is a part of my Fall too since the temperatures are dropping I can bust out my leather jackets. I started with three coats of OPI My Vampire is Buff for the leaf nails and two coats of China Glaze Liquid Leather. I then painted different leaves with Finger Paints Micheltangelo, Cult Nails Feel Me Up and OPI My Private Jet. I finished off the leaves with veins in OPI My Vampire is Buff. 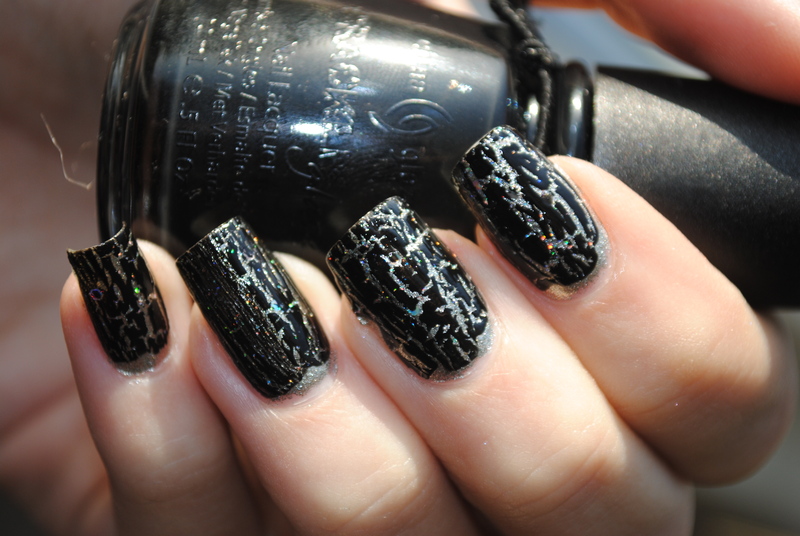 For the leather nails I added a coat of Barry M Black Magic crackle and did not topcoat it to keep the matte finish of the crackle. I dag er temaet efterår og jeg valgte at lave blade og læder negle. Læder er noget jeg forbinder med efterår, og så er farverne på blade på træerne så flotte på dette tidspunkt. Klik på den blå blob for at se hvad de andre har fundet på til efterår. 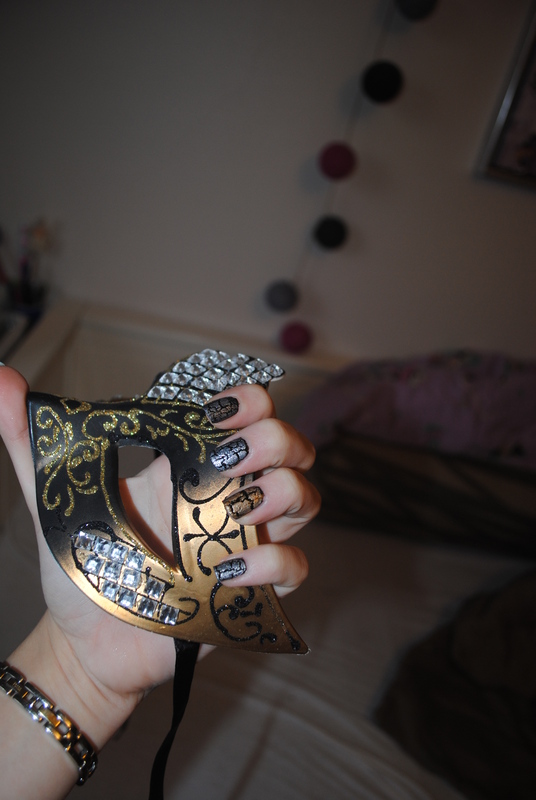 I was going to a costume party in february and had decided on a blue dress pairing it with my black, gold and silver mask I bought in New Orleans last year, but unfortunately the party got cancelled so I never got to rock my mani with the mask, but I took some photos with it. I used two coats of China Glaze Liquid Leather and added Platinium Pieces on all my nails except the ring fingers which I topped with Tarnished Gold. 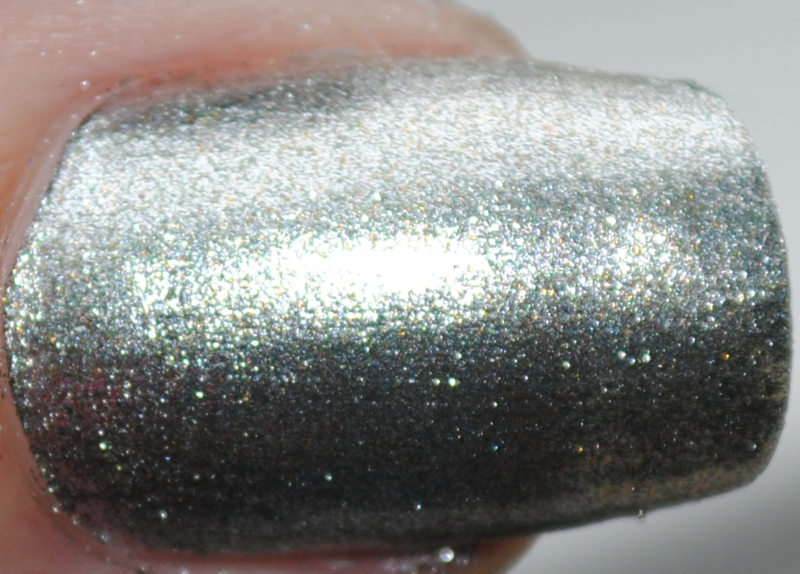 Platinium Pieces is a white silver crackle, much lighter than OPI Silver Shatter which is more of a gun-metal silver. Tarnished Gold is a warm gold crackle, much more true gold than 17 Crackle Top Coat which is a champagne gold. 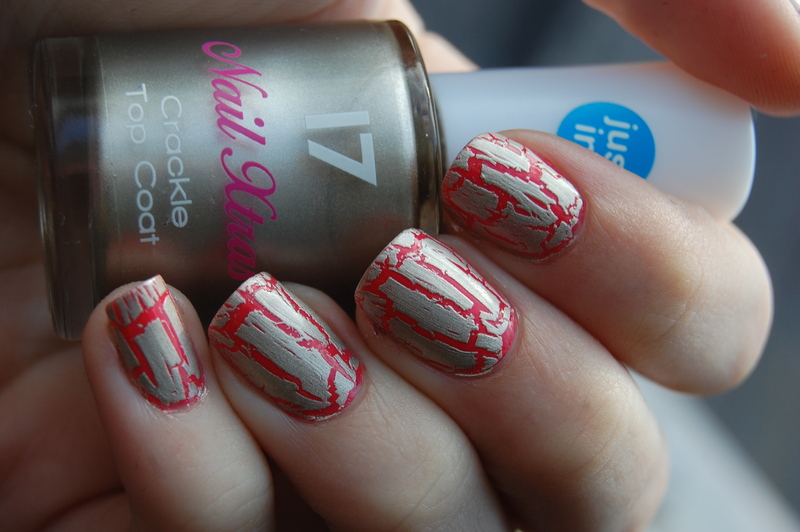 I really liked the combo between the two crackles and it’s an easy way to do nail art without any effort. 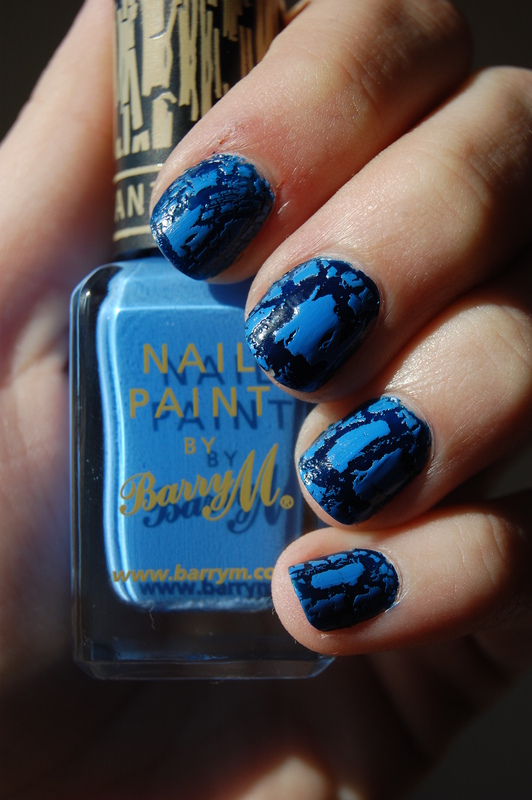 This is a periwinkle blue crackle. I don’t have anything like it so it’s quite a unique crackle polish. It’s easy to apply but it smells weird when you apply it. The other colors don’t smell that way so it could be the blue color making it do that. I have it over H&M Dark Blue which is a dark blue jelly. It looks almost black in the photos. It’s from a long time ago so that’s why my nails are so short. Hi everybody. A lot have been happening in the last few months where I haven’t been blogging. I graduated from high school June 26th and before that I had a month of exams, 3 written and 5 oral ones, so I decided to concentrate on reading for those. Now I have applied to college and waiting on hearing if I’m accepted their. I can’t imagine not seeing my classmates everyday I also managed to swatch my entire nail polish collection of 300 polishes (OMG I did not know that I had that many) and create an entire new buy list for my summer vacation in Florida where I will be going tomorrow. I have prepared post every other day for you guys and on the other days I will post about what I have been doing and what I have bought. I’m also thinking about starting a YouTube channel which will both be nail polish and makeup related. Plus I have decided to only write in English. It’s time-consuming writing both in Danish and in English, I know a lot more nail polish words in English, plus if I start a YouTube channel that will be in English too. I wore this polish over a year ago, so if you are wondering about my nail length that’s why 🙂 I wore the Primark polish again last week, because I was going to a “rave” party with UV lights and glow sticks. It was supposed to glow under UV lights, and even though I didn’t get a picture I can say that it does. It’s not the most glowing polish, but it lights up in a pink color. Coral is a coral jelly/creme. It’s quite pigmented but doesn’t last that well on the nails, but it’s fun for a night out so you can have glowing nails. When I wore it the first time I used it as a base for the gold crackle I bought in London from 17. It’s not really a true gold more a champagne gold. The cracks are bigger, but it’s nice to try something different.It’s not a gold color like the one from China Glaze that I have some pictures of on my computer. Maybe I should show you those tomorrow. Jeg havde det neglelak på for over et år siden, så hvis du undrer dig over om min neglelængde så er det derfor 🙂 Jeg havde denne Primark lak på igen i sidste uge, fordi jeg skulle til en “rave” fest med UV-lys og glow sticks. Den skulle lyser op i UV-lys og selvom jeg ikke har et billede jeg kan vise, så lyser den. Det er ikke den mest glødende lak, men den lyser op i en lyserød farve. Coral er en koral jelly/creme. Det er ret pigmenteret, men den holder ikke så godt på neglene, men den er god til en aften i byen, så du kan få glødende negle. Da jeg havde den på første gang brugte jeg den som en base for guld cracklen jeg købte i London fra 17. Det er egentlig ikke en rigtig guld farve men mere en champagneguld. Cracksne er større, men det er rart at prøve noget anderledes end de sædvanlige. Det ikke en guld farve som den fra China Glaze, som jeg har nogle billeder af på min computer. Måske skulle jeg vise dem i morgen. Sofie said crackle. I have a couple of different crackles, but decided on this one. I started out with two coats of Your Royal Shine-ness from The Serena Williams collection which is a silver foil with gold shimmer. 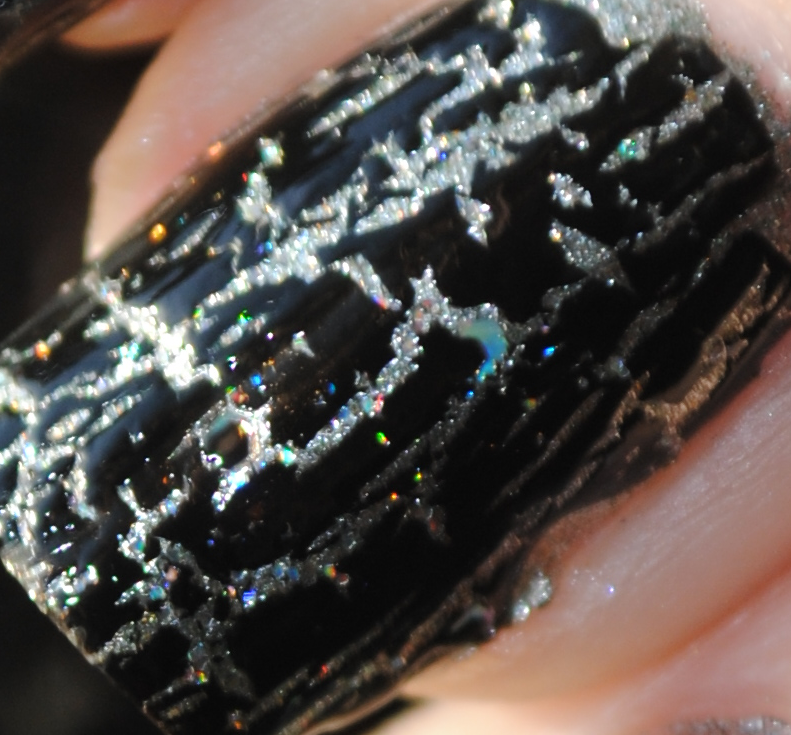 I topped it with one coat of Servin Up Sparkle a holographic glitter topcoat. After a few days I put China Glaze Black Mesh over and loved the silver and little bits of holographic glitter that you could see through. Sofie sagde crackle. Jeg havde et par forskellige farver liggende. Jeg startede med to lag af Your Royal Shine-ness fra OPI som var med i Serena Williams kollektionen. Your Royal Shine-ness er en sølv foil med små guld stykker i.
Jeg puttede Servin Up Sparkle ovenpå som er en sølv holografisk glimmer topcoat. Efter et par dage puttede jeg China Glaze Black Mesh ovenpå. Jeg elsker hvordan man kan se sølv og holografiske glimt som man kan se mellem det sorte.